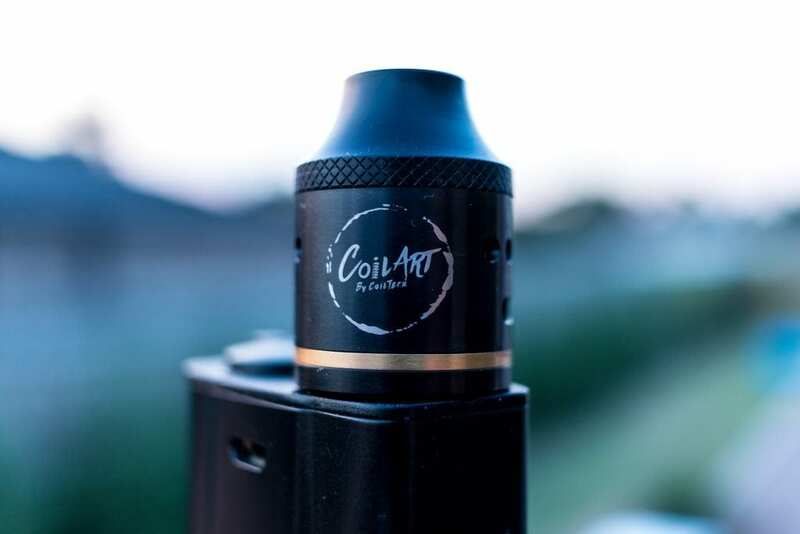 CoilArt is rapidly becoming a prominent force in the Vaping game, with a steady amount of offerings that compete and often out-do some of the most popular atomizers out there on the market. CoilArt aren’t shy about making their products stand out from the crowd, as we have seen with the Mage RTA and Azeroth RDTA. 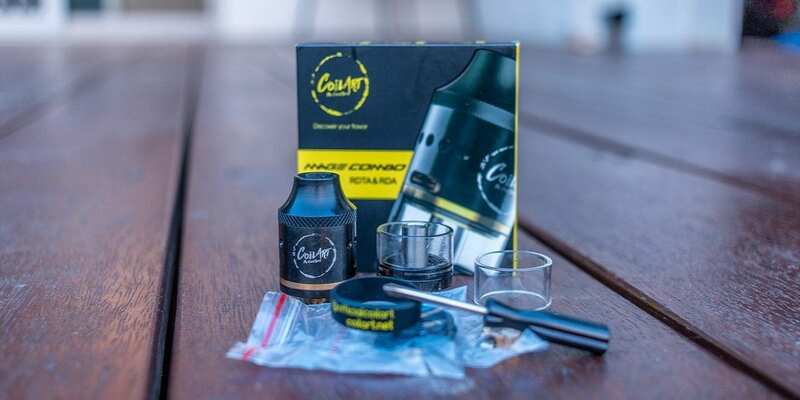 CoilArt have added to their Mage line of products with the Mage Combo. An all-in-one package that can be used as a straight up RDA or as an RDTA. It can be further customized with your choice of bridge posts being either the clamp style or velocity style. I would like to thank CoilArt for sending the Mage Combo my way for the purposes of this article. Click Here to Check out the CoilArt Mage Combo! Use Coupon Code GBecig for 15% off! The packaging that the Mage Combo comes in is on par with the rest of CoilArt’s line. Very catchy black and yellow adorn the box with a product picture on the front, the CoilArt logo and the words Mage Combo. Upon opening the box, we find the tank fully assembled in RDTA mode sitting comfortably in a grey foam insert next to the spare parts. The box is padded well enough to ensure there will be no damage caused in transit. I was sent the black version of the Mage Combo and I can say that it holds true to the good looking reputation that CoilArt prides themselves on. 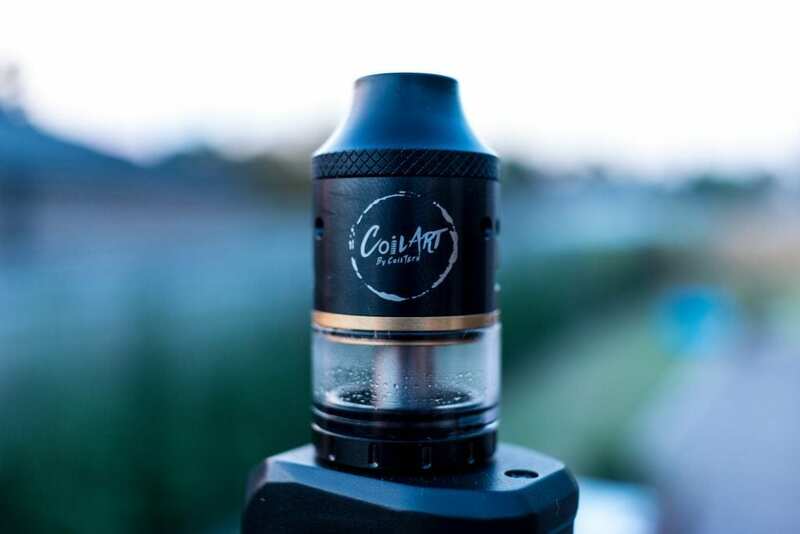 The familiar Mage shaped drip tip sits on top of the tank, the CoilArt logo is inscribed in silver and below that a nice gold ring that adds some bling and shows off the 24K Gold plating that the deck is made from. The spares pack contains everything you would need from o-rings to spare screws and a screwdriver. It does ship with an extra glass, which is a definite pro in my opinion. It includes the screw on RDA base section to turn the tank into an RDA and also contains another set of posts which can turn it into a Velocity style deck. I opted to keep the clamp posts in, as I find them easier to use and plus I have a whole bunch of Velocity styled products already. The build quality and general feel of the Mage Combo is top notch, as per the quality of previous CoilArt offerings. There is no smell or signs of left over machine oil and the fitment is super smooth with no sharp threads or loose o-rings. The top cap is a little different to the previous Mage caps, with the addition of a textured ring around the base to aid in unscrewing. It is however the same shape up top, with the same a curvature of previous models – which is a huge pro for me as I love the shape of the mage drip tips. You can also fit a 510 drip tip of your choice in the top of the Mage Combo top cap, as you can with all of the previous Mage tanks. We find the Mage Combo has both side and bottom airflow, which makes for an abundance of air intake. The side airflow, hits the coils directly and is adjusted via the topcap. The bottom airflow obviously comes up below the coils and is adjusted via the chamber placement directly. Again, as per the rest of the Mage line, the Combo is a 24mm atomizer and comes in at 54mm in overall height. It’s made from SUS304 grade stainless steel and is available in 6 finishes. The glass is made from Pyrex and it features heavy use of 24K gold plating throughout – this appears on the 510 contact, the deck and the posts. The Mage Combo comes apart into six sections for ease of cleaning and building your coils. Unlike other combo tanks, the Mage Combo does not have a removable center pin, there is no chance of loosing this. To assemble the Mage as an RDA, you simply screw in the RDA base and you are good to go. To assemble as an RDTA, you just need to remove the RDA base and screw on the RDTA base and glass and your all set! It really couldn’t get much simpler and hats off the CoilArt who have nailed the design process here. Building on the Mage Combo is very straight forward, as the chamber is removed entirely to expose the build deck. There is nothing in the way when you are installing your coils and there is plenty of room so you can tweak them to your heart’s content. The post clamps are a very welcome addition in my book as the coil legs fit under them easily and there is only one screw per post to have to attend to. The drawback of having the screw in the middle, is that thick diameter coils are unlikely to fit in dual configuration, I’m talking large gauges here – more than the standard hobbyist would require so this isn’t a real concern. The clamps ensure that those coils are held in very tightly and there is no chance of movement or loose connections here. There is room to fit some larger diameter coils if you wish and obviously a whole other realm of different possibilities when you install the velocity styled posts. Wicking is also straight forward in terms of most other RDTA and RDA out there. I found the best place to cut the wick was just past the bottom openings on the deck. This ensures that you can use it in either RDA or RDTA mode without having to rework or adjust drastically when you want to change configuration. As long as you fluff your wick well it will work in either mode, as you tend to tip the reservoir up to one side when using it as an RDTA and it will wick accordingly. Obviously there is less concern when using it in RDA mode as you drip straight onto the wick. If you like a long wick which hangs down into the reservoir on your RDTA, then the Mage Combo will also accommodate of this, it’s just not my style of wicking. Filling the reservoir is not as simple as it could be as there is no side-fill port. You need to either push one of the wicks out of the way to run juice down into the reservoir, or unscrew off the deck part all together. Neither, for me, seem like a quick and easy option, so this is where the Mage Combo lets me down. Don’t get me wrong, you can still fill it easily, it just takes time to have to remove the deck from the center pin, fill it and then put it back together. It holds 4ml of juice in the reservoir and is easy to see where your level is at due to the glass tank. The build I tested on the Mage Combo was a dual SS316L fused Clapton, which is one of my go-to builds and has the ability to run in TC mode. It came in around 0.3 ohms on the Mage Combo with the clamp style deck and was wicked with Japanese organic cotton. The flavor got from the tank was superb and the vapor production was just as impressive. I’m not sure what it is with the Mage line, but the flavor concentration in them is top notch. Maybe it has something to do with the shape of the top cap and the efficiency of providing a dense flavor hit – I’m not 100% sure. The vapor production is definitely in-line with how the airflow is configured. This thing at wide open, has airflow for days! Wide open, you have the ability to run some pretty exotic coil builds at high temps because the airflow will just keep up. I backed both airflows off to around 3/4 and I found this was perfect for the way I like to vape. Somewhere between 60 – 80 watts and this was my sweet spot, with that particular airflow configuration. I could just as easily gone higher in watts and opened the airflow up more, this tank could easily handle that. In RDTA mode, the wicking kept up very well and I didn’t get any dry hits at all. I think this has to do with keeping your wick ends very fluffy to maximize absorption of liquid. Temp Control mode works like a champ and as it should do with no surprises. I tried a dry burn test and found the deck to hold up well here and it transfers the temperature information to the mod well. I didn’t experience and connectivity issues or ohm jumping and the Mage Combo looks great on all the mods I paired it with – this was in both RDA and RDTA mode. I didn’t pick up any differences in flavor, vapor production or performance when swapping between RDTA and RDA modes. It really just comes down to how you prefer to vape. If you’re up for dripping, then run the RDA mode, if you want something for out and about and don’t want to drip – then run the RDTA mode. You get the flavor and performance of an RDA just with a 4ml reservoir attached. The top cap can get a little hot if you chain vape and would depend on your coil build and wattage, however this is not by a any means as bad as some of the others on the market. CoilArt once again prove that they are pioneers of design and fore-thinking. They take a concept that is very popular, however they add something unique or think of something better that they can incorporate into the design. They make it sexier and release it to the public. CoilArt are smart in the fact that they include all of the necessary parts as standard issue to customize their products, without the need to make additional purchases on top your original order. Given the performance of the Mage Combo and it’s value for money, I have no hesitation in recommending it if is something of interest to you and your vaping requirements. It will be a diverse tool in your arsenal and something you can keep customizing over time. I hope this has helped in your search for your next RDA or RDTA. Please leave any questions or comments below, we always appreciate hearing from our readers.